It was not a good week for the Big 12 favorites. Baylor went into Morgantown undefeated and ranked at No. 4. West Virginia, then unranked, was tied with Baylor 27-27 in the 4th before pulling ahead and beating the Bears 41-27. Ironically, Baylor’s first loss a season ago was on the road while the Bears were ranked No. 4 in the country – that time was a blowout loss at Oklahoma State. In Saturday’s loss, Baylor QB Bryce Petty still managed 223 yards in the air with no interceptions. The Bear running game was nonexistent, as the team netted a dismal 95 total yards, with no 100-yard rushers. West Virginia QB Clint Trickett was exceptional in the Mountaineers’ win, completing 23 of 35 pass attempts with only one interception and 322 yards through the air. Look for the patented Dana Holgerson air raid to continue as WVU hits the road this week. The best news coming out of Stillwater this week is that today the school released a statement that the Sports Illustrated claims from Thayer Evans’ series, “The Dirty Game,” from September 2013 were “fundamentally unfounded.” It doesn’t help now, that Jhajuan Seales and Juwan Offray were arrested Sunday morning on complaints of public intoxication after being found asleep at Whataburger Sunday at 4 a.m., allegedly in the drive-thru. Back on the field, it isn’t looking good. The Cowboys frankly just look bad on Saturday as TCU kept the Pokes out of the end zone the entire game, although Ben Grogan had a good game. Trevone Boykin went 26-for-39 with one interception (by OSU DL James Castleman) with 410 passing yards to Daxx Garman’s 132 yards. The Horned Frog defense snapped OSU’s 58-game streak of scoring at least 20 points, dating back to the 2010 Alamo Bowl season. With the meat of the Big 12 schedule coming up (West Virginia, Kansas State, Texas, Baylor, Oklahoma), the 5-2 Cowboys could just frankly be screwed. Oklahoma beat Oklahoma in Norman on Saturday. Wait, what? I can’t really say that Kansas State won that game, considering the fact that one of the best kickers in the country, Michael Hunnicut, missed 2 Field Goals from 32 to end the first half and from 19 with under three minutes to play in addition to having an extra point blocked. K-State played great, I’m not saying they didn’t. Jake Waters looked great with 225 yards passing and 2 TDs. But, I still believe that the Sooners beat the Sooners. Those 3 kicks alone are 7 points – OU lost by 1. Texas Tech finally got their first win in a month and a half (Sept. 6 at UTEP) against Kansas 34-21 at home. Texas came from behind to top Iowa State at home, hitting a field goal as time expired to win it. No. 11 Kansas State over Texas – In Manhattan on ESPN at 11 a.m Saturday, Texas has not looked good at any point this season (with the exception of the Oklahoma game). In coaches’ terms, they showed resiliency against Iowa State, but that’s about it. I’m not expecting to see much out of the Longhorns on the road this week. Look for K-State QB Jake Waters to have another big game. No. 22 West Virginia over Oklahoma State – America’s Greatest Homecoming Celebration likely won’t be too great for Oklahoma State. The now-ranked Mountaineers roll into Stillwater after a come-from-behind win at Texas Tech and a 14-point win over Baylor. The biggest, most glaring problems for OSU are the offensive line and offensive play-calling, but the overhyped defense doesn’t help, especially on late down situations. 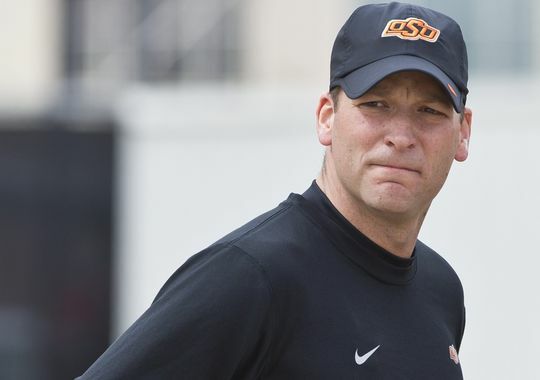 If Cowboy LB Ryan Simmons can contain Clint Trickett, the Pokes have a better chance at home. No. 10 TCU over Texas Tech – While Texas Tech won the last meeting in Fort Worth (a 56-53 thriller in 3OT), that was a different TCU team. Boykin wasn’t the opening day starter two years ago. Davis Webb was in high school. Kliff Kingsbury was the offensive coordinator for a Heisman-winning QB at Texas A&M. This year, TCU is controlling their own destiny and has a legitimate shot (although slim) at making the inaugural college football playoff. With Texas Tech’s defensive struggles, TCU’s offensive prowess and TCU’s stronger defense, don’t expect too much out of the Red Raiders on Fox Saturday afternoon.